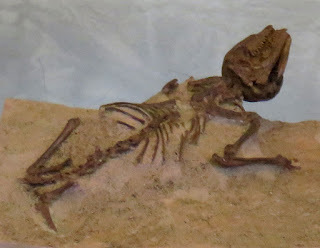 Asiatherium reshetovi mammal fossil displayed at Muséum National D'Historie Naturelle Jardin Des Plantes Paléontologie et Anatomie Comparée, Paris, France. It was found in Barun Goyot Formation of Gobi Desert Basin in Mongolia. The fossil dates to Late Cretaceous Period. Image taken August 2016.